Even the biggest deniers of global warming could easily change their minds these days. The average temperatures this summer are at a 100 year high, and bear in mind that these things are measured across the Globe. Daily temperature peaks are even higher and it seems like having a pool has become a necessity for every household. That especially goes for the ones with kids and adolescents. Sitting around the house under the AC during the summer break is not a favorite thing for many kids these days. Having a pool solves one problem, but begs the question: How to make it exciting as much is it is refreshing? This is where pool basketball hoops come into play. Kids and adults alike love having fun in the water and a poolside basketball hoop is a perfect way to create loads of excitement. Considering that this is not a thing you buy all that often, you should know a couple of things before you make your pick. Here are a couple of things you should consider before getting one yourself. Naturally, you want the best quality for your family and friends so picking the best pool basketball hoops comes down to 4 key factors: safety, adjustability, the build quality and the price. And you should perhaps think about them in that particular order as well because safety should definitely be your top priority. Considering that having kids be physical around the pool carries certain risks in itself, a basketball pool should never present any additional challenges. Hitting a head or cutting yourself on such a prop should be avoided in the buying process rather than dealing with it after the fact. Adjustability and the quality of build are somehow closely connected and you can pick on over the other or make a compromise. The price is something we took a deepest look at because unfortunately, that can sometimes be a deciding factor for many buyers. That’s why we compiled a short list of the, in our humble opinion, best pool basketball hoops that offer great value for money. Check it out. We picked this model because it touches on all of the key factors we mentioned with moderation and balance. This is a safe pool basketball hoop and requires no expert assembly. There are no sharp edges or any surfaces that could potentially cause injuries even in the extreme circumstances. This hoop is made from a durable Polyurethane and it can withstand a lot of punishment. Sturdy construction and a base that is filled with water offer satisfactory stability which allows this hoop to be placed almost anywhere around, or in the pool. With a total weight of 115 lbs. (with the base filled), the entire hoop can withstand a fair amount of rocking and stress. The thing we especially like about it is that a stainless steel rim actually feels good and offer quite a good bounce, similar to regular basketball hoops. The assembly process is straight forwards and it shouldn’t take you more than 15 minutes from unpacking to a finished product. 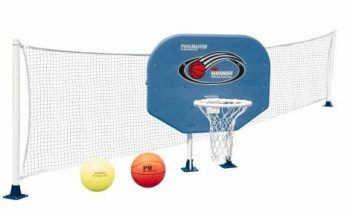 All weather net, a bright white color, and a matching ball all contribute to making this under 200$ package a great buy. This entry on our list comes from a manufacturer we often recommend and is yet to fail us delivering on the promises. Their 1306 model comes with a 44″ Shatterproof Fusion backboard made from High-Density Polyurethane. This makes it extremely durable and strong and the padding from all sides provides adequate protection. As far as the safety features you ought to look in a pool side basketball hoop, this model has got all of its bases covered. Their Shatterproof Fusion technology has been tested on regular and portable hoops and it will keep you safe in this pool side version as well. The thing we like the most about this hoop is the adjustability factor. With a 2 piece telescopic mound, this pool basketball hoops offers plenty of options for adjusting the height which means, kids, adolescents and adults can use it without a problem. A 27-gallon base provides more than enough stability even when you lift the backboard at the full, 7 feet extension. The second best thing, which could easily be the first one as well, is the value for money. In just under 150$, you get an amazing product that will serve you well and turn your pool into a fun zone. Another Lifetime model made its way to our list, and the reasons for it are fairly obvious. This time, we will go through our factors backwards and mention the price first. You will hardly find a better deal out there than this 1301 model. When it comes to the price over quality ratio, we can’t help but recommend this pool basketball hoop with full confidence. The quality and adjustability are at the highest of levels. High-Density Polyethylene board, and big 44″ board at that, sits on top of a sturdy telescopic pole designed to be adjustable from 4 to 6.5 feet. Rust resistant construction will hold well against the elements and the harsh influence of the Sun without a hiccup. A heavy duty base that can be filled with water or sand provides enough stability for a bounce from all distances and an all-weather net feels and sounds like game nets, even while being soaking wet. The bottom side of the backboard features additional sturdy foam coating that prevents any injuries and mishaps around the hoop. Overall, this is an incredible value for money buy and you won’t go wrong with it. Based purely on the way it covers the first three factors: safety, adjustability and build quality, this is perhaps the best pool basketball hoop on the market. After a statement like that, the price factor should also be favorable as well, but we will go a bit further than that and claim this boldly: in pure value for money ratio, this is probably the best buy on the market. We say that because this is really a high quality, well build and well thought off pool basketball hoop. A sturdy construction that allows infinite increments for up 56 inches above the swimming pool deck makes sure this model could be used by kids and adults alike. The finishing touches like powder coating on the aluminum pole and vinyl coated stainless steel basketball rim elevate this hoop above the competition in terms of the quality build. 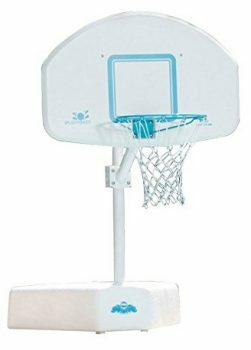 Safety features include padding on all sides of the backboard and a 25-gallon base that prevent this 200lbs (when fully loaded) hoop from tipping over or swaying in any direction really. Everything from the material to the design and the adjustability confirms that this is one of the top models out there. This model is included on the list because it is so unusual looking and features a different design than the rest of the entries on the list. Instead of having three elements like the rest of them, a base, a pole and a backboard, Swimline opted for a design that combines the base and the pole into a single element. This makes for a very stable and sturdy constructed pool basketball hoop that will for sure withstand whatever type of punishment the Sun and the moisture inflict. As far as the safety goes, we got no issues with this one and you won’t have either. The height of the loop can be adjusted with ease and the assembly process is pretty much straight forward. Now, one of the best things about this hoop is the backboard. 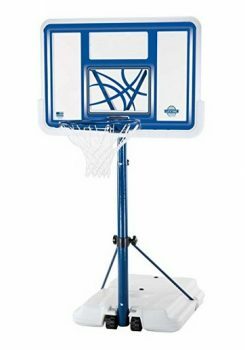 It offers a great bounce and coupled with a regular size game ball rim, it provides loads of opportunities to make a basket. Combining all of these features with a competitive price and a unique design, this is definitely a smart buy and the user reviews only go to prove our opinion on this pool basketball hoop. 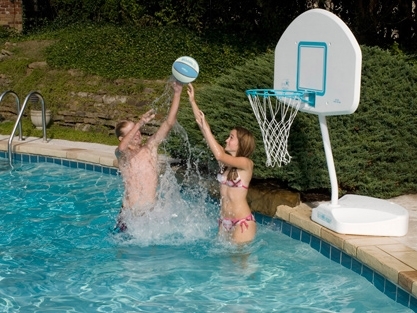 We decided to conclude this list with the most affordable alternative among pool basketball hoops. 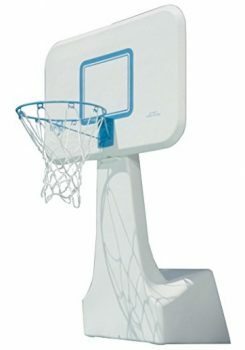 This is a permanently mountable basketball hoop that uses a 4″ or wider rail for mounting. The backboard is made from an all-weather hard material and it’s a bit smaller than the previous boards we discussed at 34″ of width. Seeing as there are no movable parts on this one, there are no security issues to consider at all. The adjustability factor, however, is an area this basketball hoop can offer plenty. Even though it is a bolt down type of hoop, which limits the option from adjusting the height, this hoop offers something else in return. It comes with a volleyball net included in the package which provides a great deal of variety. Instead of changing the parameters of the game, why not change the game itself. 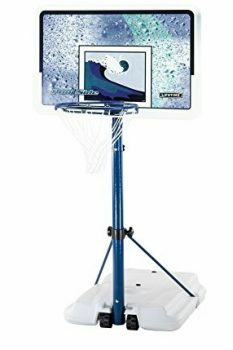 In fact, a complete set includes: Basketball backboard, perma-top mounts, hoop, net, inflatable vinyl ball, volleyball net, volleyball perma-top mounts, poles and deluxe game ball with inflating needle. All of that for a really competitive price? Now you know why this pool basketball hoops made it to our list. Whatever model, or models, you opt for, the ones from this list will definitely provide loads of fun. The idea of needing something like a pool basketball hoop to have fun while keeping cool in the first place may sound a bit awkward for some of you. But let us tell you this, you don’t know how fun having one around is until you try it. 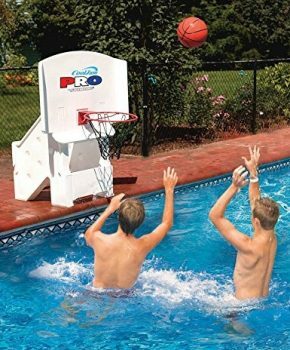 We tested a number of pool basketball hoops and after a while figured that most of them are extremely fun, regardless of the price or quality. We simply enjoyed making a game out of it and quickly forgot about the scorching weather outside, or anything else other than the game we were playing actually. And in case you were ever wondering what games we played while testing these products out, here are a couple. This is excellent if your pool is up to 4-5 feet high. That means you can stand on the floor and move through the water with without swimming. The rules of the street basketball can be applied to this game too, and the fun thing is that the more people that play it, the merrier. We played a 3v3 game and spend close to two hours having a neck and neck type of a game. You can pick your own rules if you want to, but definitely, the dunking is the best part of it! You will understand it the first time you tomahawk it like a pro. This is an excellent game if your pool is over 7 feet tall, meaning you cannot touch the bottom of it and have your head above the surface. This means you have to keep swimming while playing. The challenge of this game is in the shooting motion. It is hard to lift your hands above the surface and perform a nice follow-through shot. Again, a 3v3 game will be a low-scoring, but extremely fun affair and definitely an experience you would want to repeat regularly. Make up your own rules regarding the small nuances, but don’t change this one: whoever gets his shot blocked, gets sidelined for 30 seconds. This rule makes it so much fun, try it and you will see. This is more improvisation than a game. Basically, let yourself loose and try to perform the most outlandish dunks you can imagine without the fear of looking silly. In fact, the sillier you look, the more fun you will have to play this game. A pure enjoyment without limitations. A 720 no look? Why not? The landing will always be soft. I hope we brought the notion of having a pool basketball hoop a bit closer to all of you. And once you do decide to get one, any choice from our list will fulfill all of your expectations and it won’t disappoint you in any way. The way we see it, not having one means missing out on loads of fun that turns scorching hot summer days to an activity you are looking forward every single day. And at prices of the products we selected for our list, that is a smart investment for every household.